Unpacking My Library: Architects and Their Books (Yale University Press, 2009). Edited by Jo Steffens, with an introductory essay by Walter Benjamin. 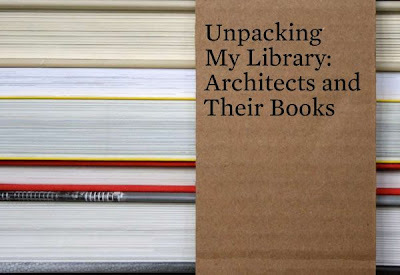 A quick note to encourage everyone out there to pick up a copy of Unpacking My Library: Architects and Their Books. This handsome book features ten architects accompanied by pictures from their personal libraries. Each respondent also provides a list of their 10 favorite books. The book is based on an exhibit held at Urban Center Books. As an aside, I'm trying to imagine how to use this book in the future. In writing the histories of these architects (or of the architecture profession in the early 21st century), what value would we assign to libraries and personal collections? This all stems from a nighttime discussion with colleagues regarding the value of personal ephemera, biographies, and autobiographies in understanding architectural objects. What, for example, would we make of the fact that several of the architects featured in Unpacking My Library listed Gravity's Rainbow as one of their 10 favorite books? Does owning this book become an indicator of good or smart design, or just impeccable taste? it's an interesting little book and very revealing in lots of ways. i've written a review of it for the upcoming issue of icon. i was interested in the gravity's rainbow choice as well. diller and scofidio are the only contributors to step out of the realm of the tastefully intellectual! I look forward to reading your piece! And yes, didn't D+S list "Harold and the Purple Crayon" as one of their top 10 books? It's a hard thing for me to confront, especially since, these days especially, I am much more of a book buyer than a book reader. It does seem like once I buy a book I don't read it, those library deadlines (borrowdirect / the public library) help. I'm guilty as charged on that count as well.